We were about a mile downriver on a dangerous path. The footing is treacherous, with inch-long thorns snagging you while sticks and holes (many of them dug by you know who) hidden under fallen leaves trip you, and there are so many low branches that sooner or later one will clock you. Take it from me. I walked into one hard enough to score a nice, long cut right through my hat and into my forehead. The bang was enough to make me exclaim and crouch down with my head in my hands. When I looked up, Roo had come running back. She was looking at me, her nostrils working, worried. But Roo enjoys this winding and complicated path too much to forego it. It’s one of her favorites, filled with obstacles that she likes to jump over or dart under at top speed. Seeing how much she loves it, how alive she is when she runs the course, makes it worth the forced march. Another feature of that part of the river is all the construction - by beavers. Everywhere you look there are large trees that either fell on their own or are chewed down to pencil nubs and draped across the river, where they support vast structures of branches and sticks. Many of them are 30 feet across and eight feet high. Roo and I were at a place where the ruins of an old dam were piled up around a rotting cottonwood tree, shaped like a snowdrift made of sticks. There’s something about this particular curve that is to Roo what a hill with rocks sticking through the snow is to a daredevil ten-year-old with a sled. When she sees something like that, she is compelled to run it so fast that she has to bank all the way over to make the turn. It makes her laugh like a madman. I always wanted to get a shot of her coming around that bend, but the position never worked out. Finally I got my chance. A scurrying mole got her attention and gave me the time I needed to lie in wait for her. I couldn’t see Roo around the bend, but I could hear her crashing through the dry sticks and leaves as she got close. I got down low for a good angle. Just when I was about to trip the shutter, Roo screamed. Now, Roo is a tough, hard dog. She is covered with cuts from barreling around the desert. She couldn’t care less. I have never heard her so much as whimper, even with multiple large cactus spines between her toes. The sound that came out of her had to mean something bad. It wasn’t just a scream - it was a surprised bark with a painful scream stuck in the throat of it. The rest happened fast. In the tenth of a second before she came into sight, my mind was rushing. What happened? How would I get her out of there? Would she be bleeding? Would she have a broken leg? A torn claw or a slice from one of the beer bottles the brainless break everywhere? A torn ligament? She must be pushing 70 pounds now. Carrying her could literally be the last thing my back would ever do. And without cell service anywhere near that desert stream, if something goes wrong, you’re on your own. Whatever nailed Roo threw her out of control. When she came into view around the bend she was flying sideways. She had the doomed look of a racing motorcycle banked the wrong way and headed for the outside guardrail. Her body slammed first and whiplashed the side of her head into the wall of rock and dirt. Dislodged earth and gravel showered down on her. Maybe it was pure inertia, but Roo kept moving. Holding her right forepaw in the air, she scrambled the remaining few feet of distance to me and came to a stop. I was still in the crouch. She lay twisted, half on her belly and half on her side, her hind legs in bunny position, her front legs out to the side, that right paw twitching and off the ground. She turned her head to look up at me. Her ears were flattened all the way back. She was worried. The whole thing - curve, bang, Roo at my feet - had taken two seconds, tops. As gingerly as I could I stopped her from moving the paw. She rested the side of her head on the top of my boot. She was panting hard, but she relaxed her arm to let me look her over. FIrst things first - there was no blood, but if she was cut, it could take a second for it to appear. I started to touch her arm as lightly as you would a hummingbird chick to see if anything hurt. So far, so good. Her forearm wasn’t damaged. I worked back down to the paw and inspected it for punctures, cactus spines, gashes. Everything seemed fine. As softly as I could I began to apply pressure on each of her toes. Not a peep. Claws all in tact. Nothing embedded anywhere. Slowly I flexed her wrist and extended her entire arm. It didn’t hurt. I couldn’t see a thing wrong with her. “I think you might have made it, Bearface,” I said. My heart rate started to come back down. While I was examining her I had already formulated plans to splint her, make a tourniquet, figure out how to heft her and haul her out of there and accept the fact that she would have to three-leg her own way over some spots. I gave the toes some more wiggles and the arm some more squeezes. Roo twisted over more and pointed her nose up to look at me, ears up, whites of the eyes showing. She wanted reassurance. An expert opinion. She curled her paw over to sniff at the bottom if it and then looked back up at me. “You’re okay.” I gave her the two pats on her rump that signify that she’s good to go. She trusted that. In one move, she untwisted and trotted off. After she ran about twenty feet, Roo stopped abruptly and looked over her shoulder at me. She was smiling. She wagged a couple of times, did one of her happy Hi-ho-Silver-and-away rearing turns, and got back to running like Roo. Three. Roo after her tests came back negative. Saturday we drive to LA. We’ve been gone six months. I don’t know how long we’ll stay. A week? Two? A month? Who knows. We rented a room in the Valley someplace where the Kahoo is welcome. There’s a pool. We’ll see how welcome we are when Roo jumps in. I haven’t been able to get a doctor appointment out here, but my doc in LA will see me. The room we rented is out in an area where I hope to find hiking trails for the Kahoo. I’m not looking forward to how mean people are about dogs in Los Angeles. There’s always someone freaking out about dogs there, even at dog parks. For those of you who have sent emails asking why the Roo ebook isn’t available as an actual paper book, well, soon it will be. It turns out that Amazon has a service that makes paperbacks. Once it’s available, I’ll do a subscription drive for free copies. Everybody on the subscription list will be automatically entered in the drawing, and five will be randomly picked from the whole list to receive free copies. So if you haven’t subscribed, now’s the time. It’s safe and spam-free forever. All it does is create a way not to have to rely on facebook to find out when there’s a new blog post, picture or video. 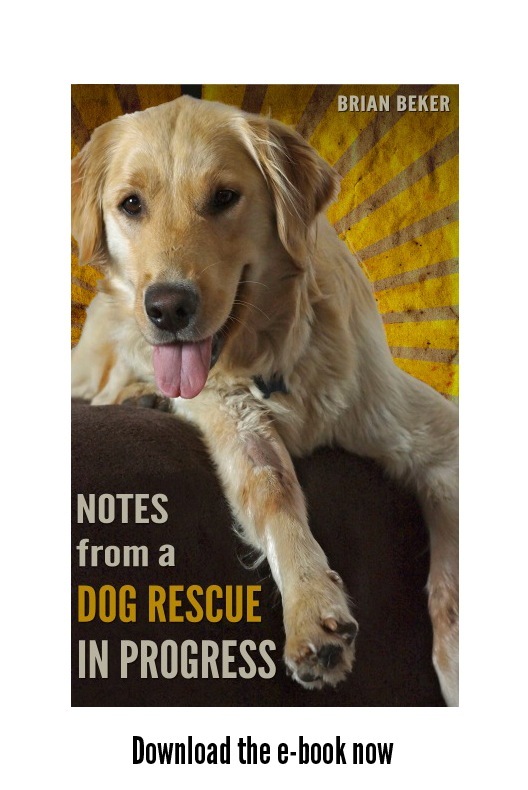 And if you liked Notes from a Dog Rescue in Progress, please consider leaving a review. As they say in Texas, too much ain't enough.